The British armor company Vickers-Carden-Loyd (VCL) developed an experimental amphibious tank in the early 1930s which was armed with a Vickers .303 machine gun in a turret and was manned by a crew of two. While the British Army did not acquire the tank, a number of them were sold abroad including China, Thailand, the Dutch East Indies and the USSR. Soviet engineers reverse-engineered their tanks to create the amphibious T-37A. A number of the A4E12 tanks were acquired by the Royal East Indies Army to provide support in the ongoing guerrilla war and were used unsuccessfully to defend against the Japanese invasion in 1941. 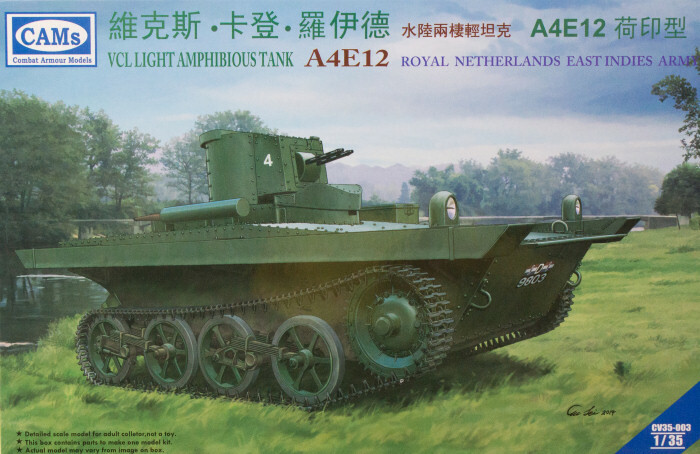 Combat Armour Models has released their second kit which replicates the VCL A4E12 in Royal East Indies Army service. The kit is molded in light gray styrene and presented on four parts trees plus a small fret of photo-etched parts. This is a distinctive bit of history in this kit being the only VCL-produced tank to see combat (briefly) in World War II. As with the full-scale example, the kit is simple should pose no challenges to the experienced modeler.